"We want to help people have fun." 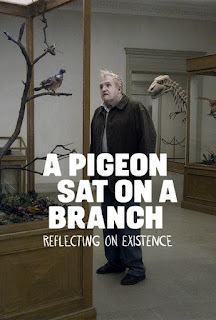 That line is repeated at various times throughout Roy Andersson's A PIGEON SAT ON A BRANCH REFLECTING ON EXISTENCE by an itinerant novelty salesman. While the old crone never quite makes good on that claim--for starters, he and his equally morose partner are probably the worst salesmen who ever lived--Andersson does, and then some. Of course, your idea of fun might not be the same as mine, or Anderrson's for that matter, so caveat emptor and all that. Even after two viewings, I still can't decide whether A PIGEON is the funniest sad movie I've ever seen, or the saddest funny movie. Either way, this 2014 Venice Film Festival Golden Lion winner for Best Film is definitely some kind of masterpiece. It's also the sort of well-nigh uncategorizable work that could have only emanated from the uniquely deadpan sensibility of Sweden's (tragically) best kept secret. One critic has described Andersson as the "slapstick Ingmar Bergman," and I can't think of a better description of his admittedly rarefied, if completely irresistible oeuvre. Andersson spends years laboring over--and endlessly tinkering with--each movie. That's probably why he's developed a reputation as a Swedish equivalent to the late Stanley Kubrick. It could also explain why Andersson has made just three films this century (SONGS FROM THE SECOND FLOOR and YOU, THE LIVING, both wonderful, are the others). All the more reason to treasure the few pensees Anderson gifts us with. Don't go into an Andersson movie looking for classical narrative filmmaking. That's not his bag. While determinedly non-narrative in form, his films are oddly cohesive just the same. Andersson likes to hang dripping fragments of themes and ideas on his imaginary cinematic clothesline and watch as they dry-age to perfection. Some characters--like the novelty salesmen and various members of an 18th century Swedish army brigade and their elfin king--recur throughout the film but it's not like they're part of any conventional plot structure. ("Plot" is beside the point in Andersson movies anyway: think of them instead as an extended series of blackout skits.) It's the very same fun-peddling salesman I quoted earlier who delivers a line that best sums up the film: "It's so beautiful. but horribly sad, too." He's referring to a lachrymose song that he can't stop listening to, but it's the perfect exegesis for Andersson's art (dare I say "genius"?). I can think of few living directors whose compositions are as rigorously layered with "stuff" as Anderrson. One of the most remarkable shots--a tableau vivant really--comes early in the film. We see a schlubby middle-aged man struggling to open a bottle of wine as snow falls silently outside a window. At the same time, in the background of the frame we observe the man's wife merrily chirping away in the kitchen as she prepares dinner. No cutting is required: foreground and background interior, even exterior (courtesy of the falling snow) are all meticulously choreographed in the same pointillist image. An existential/surrealist comedy of the bleakest despair, A PIGEON is among several area premieres inaugurating the Cleveland Institute of Art Cinematheque's new venue, the Peter B. Lewis Theater. As such, it's a perfect choice since Andersson's film represents precisely what John Ewing's venerable institution has always stood for: a place to see the type of movies you can't find anywhere else in the Cleveland area. Rejoice, Northeastern Ohio cineastes. 4 out of 4 stars.